Park rangers patrolled the New Jersey coastline along the Island Beach State Park border on Saturday. State parks and beaches were closed because a budget impasse led to a government shutdown. 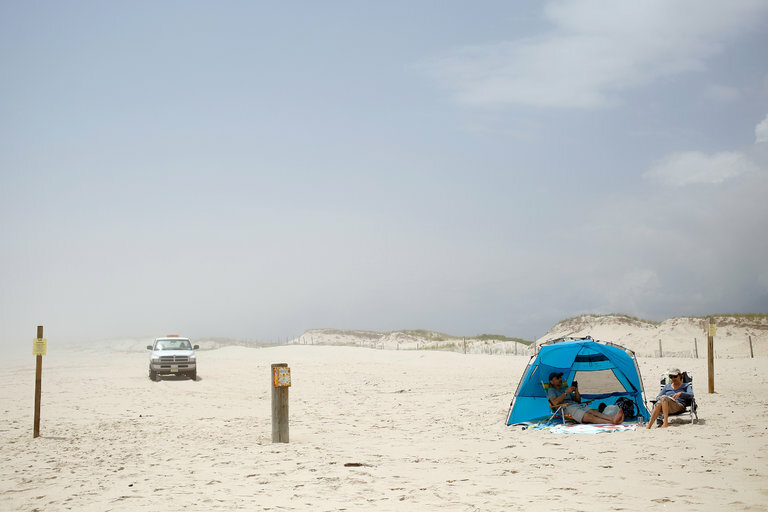 ISLAND BEACH STATE PARK, N.J. — This spot is usually a choke point for shore traffic, not a U-turn. Yet roughly every 10 minutes on Saturday morning, a new vehicle approached the entrance to the beach here — some packed with beach chairs, beach balls, fishing rods and anticipation — only to be met by two police cars and a barricade. That sunny anticipation quickly turned to frustration. As the state’s government shut down at midnight on Friday, resulting from a budget impasse between Gov. Chris Christie and the Democratic-led State Assembly, more than 50 state parks, historic sites and recreational areas were closed just as vacationers from New Jersey and beyond descended on the parks and beaches for an extended Fourth of July holiday weekend. Across the state, confusion blended with anger. Public golf courses were flooded with calls from frantic golfers wondering whether their tee times were off (they were not). Social media was awash with worries about the casinos (they remained opened), the racetracks (those, too) and the courthouses (closed). The governor’s office released a full list of affected agencies at midnight. The shutdown stems from a brinkmanship between Mr. Christie, who is a Republican, and Vincent Prieto, the speaker of the State Assembly and a Democrat. Mr. Christie is demanding that the $34.7 billion state budget include a provision requiring that Horizon Blue Cross Blue Shield spend some of its reserve fund on public health initiatives — particularly the governor’s drug treatment initiative. Absent that provision, Mr. Christie has threatened to veto any budget that lawmakers send him. Prospects for any progress on the budget negotiations in Trenton appeared dim on Saturday, as the same caustic tone that marked the deadlock persisted into the weekend. Protesters, reporters and members of the State Assembly were greeted at the Statehouse by hundreds of signs plastered on doors and walls with a picture of a smiling Mr. Prieto. “This Facility is CLOSED Because of This Man,” the signs read, listing a telephone number for Mr. Prieto’s office. Similar signs were spotted at other closed locales, including Island Beach State Park. As gridlock in Washington manifests itself daily, almost as a way of life, statehouses are locked in their own budget impasses. The tough talk and refusals to compromise could hamper government operations in states across the country. At least nine states failed to reach budget deals by late Friday before the start of their July 1 fiscal year, experts at the National Conference of State Legislatures said, though many states have provisions that allow operations to continue so the consequences will not be felt immediately by residents. Not so in New Jersey, where the state’s Constitution requires the government to suspend spending aside from public safety and emergency services if a balanced budget is not in place by the start of the fiscal year. Illinois on Saturday entered an unprecedented third year with no full state budget, as lawmakers continued meeting in Springfield. Residents were no longer able to buy tickets for two multistate lotteries, and at least one credit rating agency warned that the state’s rating could be lowered to junk, below any other state. In Maine, the state government shut down on Saturday after a budget impasse between Gov. Paul R. LePage, a Republican, and lawmakers from both major parties stretched beyond the midnight deadline. Mr. LePage said he would not sign a budget that included tax increases but did not lower the income tax, which has been a longtime goal of his. A compromise budget gained the support of Senate Republicans and House Democrats — who agreed to repeal a voter-approved tax on the state’s highest earners to finance education — but it did not get enough support from House Republicans, many of whom are closely aligned with Mr. LePage. Late Friday night, Mr. LePage presented lawmakers with his own list of demands. Sara Gideon, the Democratic House speaker, told fellow lawmakers that Mr. LePage had a “temper tantrum” when the demands could not all be met, The Portland Press Herald reported. State employees rallied outside the Capitol in Augusta on Saturday morning. Some government services, including the Maine State Library and the state Lottery, were shut down, according to The Bangor Daily News. But Mr. LePage had designated a long list of government functions as emergency services that were to stay open during a shutdown, including food assistance payments, law enforcement and the operation of state parks, which are likely to be busy during the holiday weekend. In New Jersey, protesters outside the Statehouse in Trenton directed most of their anger toward Mr. Christie, chanting “Bridgegate 2!” — a reference to the political scandal around the closing of lanes on the George Washington Bridge that hampered Mr. Christie’s presidential ambitions. Mr. Christie is in the final months of his second term in office and was barred by term limits from running again for governor. At Island Beach State Park, some would-be visitors turned around and headed home, while others walked a few blocks and paid the $8 badge fee. The family has been coming here for years, and as they walked away to try an entrance at a public beach just up the road, Ms. Rama expressed her frustration. At least one person managed to penetrate the police blockade, though. Early Saturday morning, Henry Walker, a local fisherman who has been casting off the inlet at Island Beach for more than 50 years, said he had seen a vehicle approach the police officers at the barricade. The governor’s office has a residence in Island Beach State Park, and Mr. Christie confirmed that his family was spending the July Fourth holiday there. Mr. Walker was not pleased. “I’ll tell you what,” he said, before unleashing a stream of unprintable invective. He headed back to linger just outside the police blockade and watch more vehicles pull up in anticipation, only to swing around and head back north.